9 So King Darius signed the law. Not specified in the Bible narrative. Daytime. Strong sunlight from the above right is shining in, casting shadows to the left. From left to right: king Darius sitting on his throne, three of the administrators. 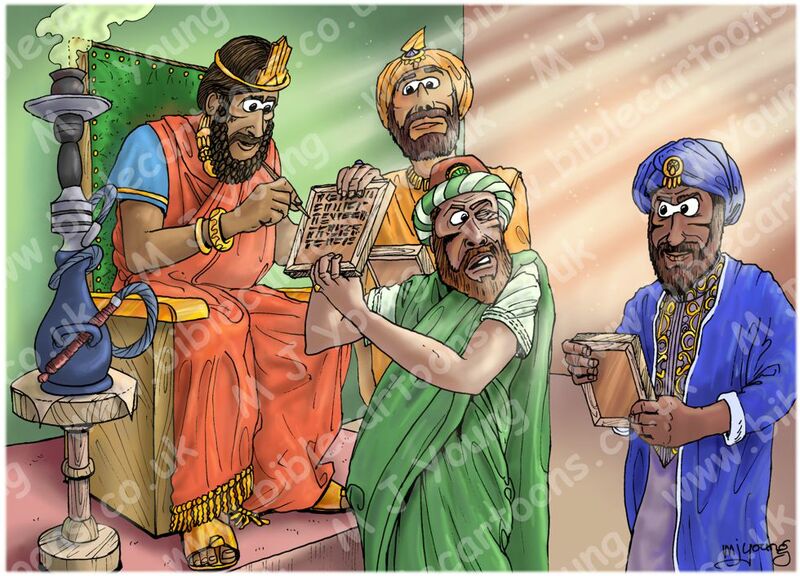 This is the third scene in this lions’ den Bible Cartoon set. In this picture we can see the three administrators I drew in the first two scenes; they have wax tablets in hand, which contain the law, which the administrators use to trick the king into condemning Daniel to the lions’ den. By the side of the king’s throne, on a table, is a hookah, which in this case is a single-stemmed instrument for vaporizing and smoking flavored tobacco. The vapor or smoke is drawn through a water basin (often made of glass) before being inhaled via a long flexible tube. You can see the smoke coming out of the top of this tall device in my picture.